+ Sip responsibly and enjoy! While we are on the top of grown up beverages, I thought I would share our bar cart, since I finally got it all reorganized. Right now, this car is making me VERY happy! That lemonade sounds SO GOOD!! I need to make it - sounds perfect for hot FL days! I am now totally convinced I need a bar cart in my life. Love how you styled yours! This sounds totally amazing! I'm dreaming of summer now! I love your bar cart. I got one last year, and am quite obsessed with them! This sounds so refreshing!!!! And I need a bar cart so bad!! There isn't a ton of room for it in my dining room, but I'll move something out for one!! haha. P.S. I do a cocktail linkup every Thursday called Thursty Thursday. I'd love it if you stopped by and partied with us! Your post is already written!! So excited the girls from Sequin Notebook started this linkup! mmmmm soon.....sooon I keep telling myself! haha yum! This looks delish. I only like things that are super refreshing like moscato, champagne or sangria. I have never made an adult lemonade but I may now that I have seen this. Mmmmmm. The bar cart looks awesome! Totally stealing your idea of saving the wine corks on it - so cute! And can't wait to try the lemonade and pretend that it's summer! Mmmmm... that adult lemonade sounds fantastic!! Definitely saving this recipe!! I love it! And I like that you save your corks. Super cute. Now I want it to be summer so I can enjoy that by the pool! 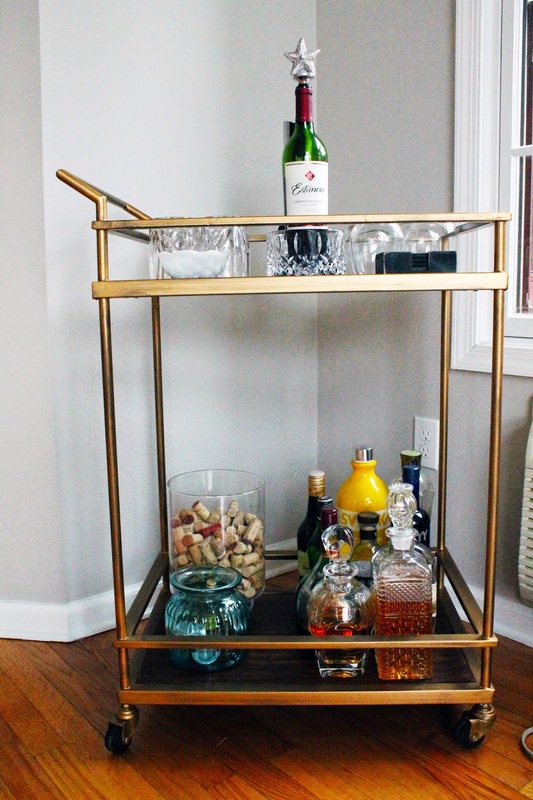 Love your bar cart! I have those exact same wine stoppers! :) Love your bar cart girl, so cute! I'm so jealous I want one so bad!! Lindsay you take great photographs- love the bar cart. I need to get me one of those.